It is not a debilitating disease. It is not a death. It is not a permanent loss or a mistake that can never be undone. But sending your firstborn off to college is not nothing. Was having four kids harder than having three? Was going from man-to-man to zone defense the biggest transition? And I have always said no. Zero to one is what rocked our world. We had no idea what to expect, what bringing a new baby into our lives would entail. We had no experience, no playbook, no way to gauge what that change would do to us, to our marriage, to our home, to our hearts. And let me assure you that when I brought Sam home from the hospital, I was a Hot Mess. I was so fiercely in love with him, so terrified I would break him, so worried I would lose myself. I cried constantly. Everything made me weep: Hallmark commercials, unexpected visitors bearing lovely baby gifts, running out of Fudgsicles. Sending him to college has felt frighteningly familiar. It’s new terrain, and I have no roadmap. It was not enough. It was still too much. And when I handed the heavy box to the sweet gal at the post office, I lost it. Tears streaming down my face, I explained, “It’s the first care package for my college boy.” I’m not sure she cared. I think she might have called security. I wouldn’t have blamed her. I’m more than a bit unhinged, needier than usual, wobbly at my core. We don’t leave the light on for him anymore. When he comes home late at night, it’s to a different home. His car sits in the driveway, unmoving. And here’s the thing: Sam is so happy. He’s probably happier than he’s ever been in his life. This kid has always wanted to spread his wings as far and as wide as he possibly can. I am so grateful that he has that opportunity now, that he’s finding out exactly how fabulous he is, that he’s creating his own life… not one we’ve defined for him. His life is so much his own now. Less ours, more his. Just as it should be. We did our job. No regrets. Not one. But I had no idea how it would feel in my bones, this day-to-day hole of Sam. This entry was posted in Me Myself And I, My Kids and tagged college, firstborn, Fudgsicles, letting go, postpartum depression, raising kids, sending a child to college, traversing the unknown. Bookmark the permalink. It gets easier.. until the last one goes and then you realize how fast time flew by. Enjoy this new phase. You are right…it’s not nothing. I think you’re handling it very well!! Thank you for sharing your heart with us! You won’t believe how much he’ll change between now and Thanksgiving break, but mostly in good ways. As a mom who survived sending her only child off to college in the midst of a tumultuous divorce, and a program coordinator at a large state university working primarily with freshmen, I can assure you you’re on the right track. YES to care packages with short, upbeat notes, Always send enough for the roommates, as well. The guy who has enough cocoa mix to invite everyone in the neighboring rooms in for a hot cup during finals week is the guy who will make lots of friendships that may last a lifetime. NO to mushy cards and sappy letters! I actually wrote notes on random pages in her spiral notebooks, and she commented later than when she would uncover one of them, it felt like I was stalking her. So much for creative parenting! My best tip for out-of-town parenting is to find your student a doctor in their college town who is on your health plan. Have him get the new patient paperwork, fill it out and have his patient account all set up with them before he ever gets sick. Then when he gets strep throat for the first time away from home, he’ll be less likely to crawl into bed and almost die (like my kid) and instead seek medical treatment while there is still an option other than the ER. Also, the roughest time for most freshmen is about two weeks into the spring semester. You’ve just been home for a month with your people and your puppies and unlike fall semester, there are no fun “welcome to college” activities planned, you aren’t nearly as excited about “being on your own” as you were in August, and the cold, dark days can easily become unmanageable. This is a good time for care packages, campus visits, and other sources of family support. 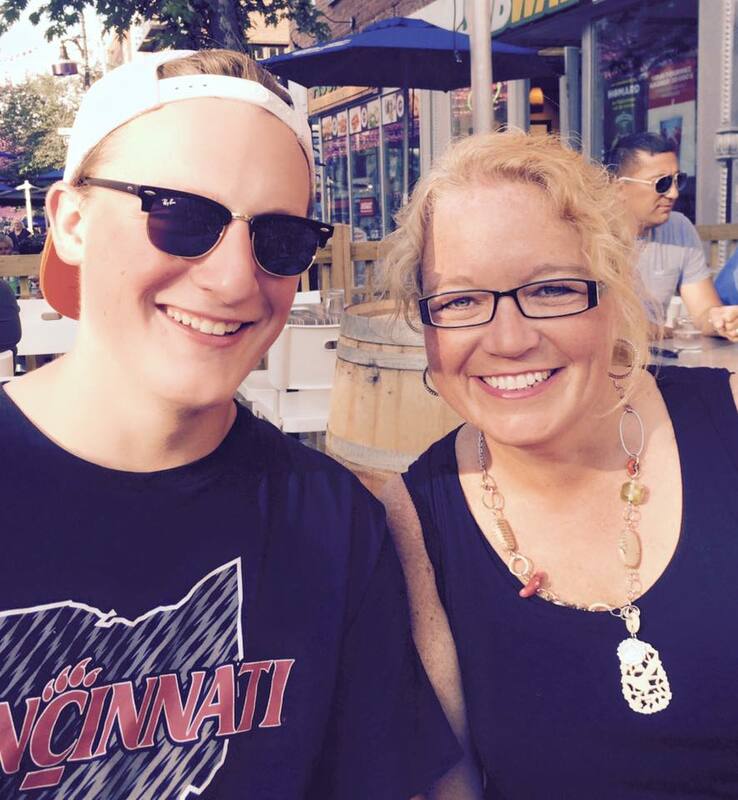 Prayers for your son’s first semester, and for you as you adapt to your changing role as his mother!